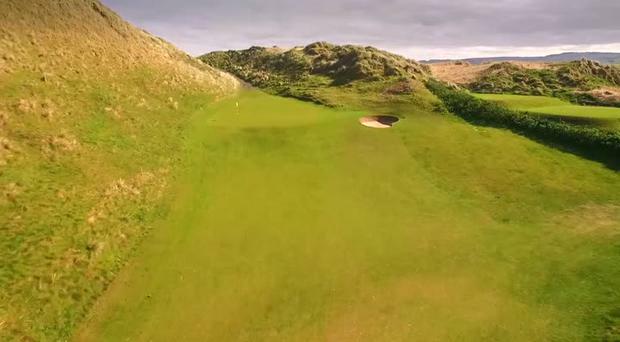 A woman was taken to hospital after she was struck by a golf ball at the Pro Am event at the Irish Open course today. The organisers of the event said she was taken to hospital for medical treatment. Meanwhile, local hero Rory McIlroy had the crowds hitting high decibel levels as he sent the ball down the fairways at near supersonic speeds at Portstewart Golf Club today. 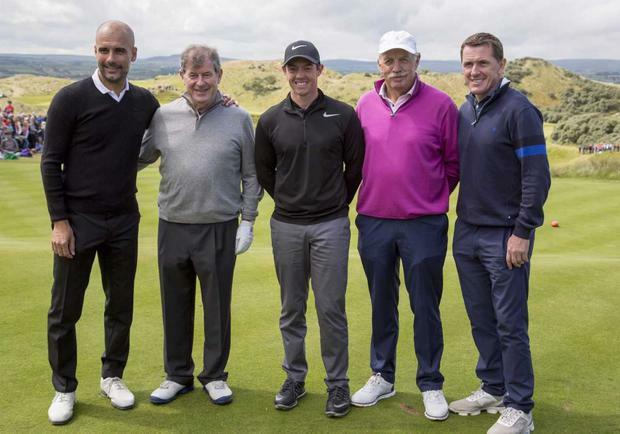 The Pro-Am curtain-raiser to the Irish Open, which begins today at the County Derry links course, pulled in some big name celebrities. Screen actors Jamie Dornan, Aidan Quinn and James Nesbitt were vying with Manchester City manager Pep Guardiola and racing legend AP McCoy in the relaxed one day event. Much of the proceeds of the event will go to McIlroy's charity The Rory Foundation which helps ill and vulnerable children. McIlroy repeated his pledge to journalists that, if he successfully defends his Irish Open title later this week, he will donate the first prize of more than £870,000 sterling to the Foundation. Jamie Dornan, star of the racy 'Fifty Shades of Grey' movie, signed an autograph at the first tee for golf-mad schoolboy Ben Johnston from nearby Portrush who uses a wheelchair since undergoing cancer treatment. Ben's mother Helen spoke warmly of the handsome film star and said Dornan joked with her 13-year-old son, saying "I doubt if you've watched my recent films." 'Cold Feet' star James Nesbitt, who teamed up with Dornan, admitted to feeling "very tense" having to tee-off in front of the large crowd. As he stepped up to hit the ball and the marshals held up their 'Quiet' batons in the air, a fan shouted "Go on Jimmy, no cold feet." Both actors proved good sports as they smiled in response to laughter that rippled through the crowd after their less that perfect opening tee shots. British broadcaster Vernon Kay, host of 'All Star Family Fortunes,' also teed off at the event. One of Kay's team members was Northern Ireland and Spurs soccer legend Pat Jennings (72) who teed off perfectly, much to the delight of his life-long friend and volunteer caddy Larry Powell, a member of the All Ireland winning Down team that beat Kerry in the 1968 final. The good-humour that the event remained strong and there was further laughter when Dennis Taylor, the 1985 World Snooker Champion, got down on his knees on the 18th green and pretended to use his putter as a snooker cue to 'pot' the ball. His team mate, former Westlife star Shane Filan, had several ladies calling 'Shane, Shane' as he readily agreed to stand in for countless selfie moments. Away from all the celebrity excitement, former Taoiseach Enda Kenny got on with the job of tackling the 18 holes with golf professional Thongchai Jaidee and teammates John Fitzpatrick and Tom Hayes. But there was no doubting that it was Rory McIlroy who garnered the most adulation. His team mates were Manchester City boss Pep Guardiola, horse racing royalty AP McCoy, and philanthropists JP McManus and Dermot Desmond. McIlroy was asked at the morning press conference if he was bothered he had fallen from World Number One to World Number Four. He shot back with a Beatles reference within a couple of seconds, quipping "Back to Ringo?" He said he did not have to worry too much because if he was still number one he would have to check the rankings every single Monday morning. Fourth place allowed him to be a bit more relaxed about rankings. He declared he had at least 10 more years of playing in his prime and he would dearly love to get a sustained run of wins in the future like Tiger Woods had achieved. His game "feels in good shape" at present and he looked forward to defending his Irish title. Last year's victory was won after he decided to embrace the extra pressure of performing in front of a home crowd. "I felt like I used the crowd support in the right way rather than it being a negative where you felt pressure," he said. He was ready to do battle for victory this week . "I don't want to talk myself up too much, but my game is feeling good," he said.